STOCKHOLM—Anxiously awaiting critiques from the judges, the world’s leading scientists nervously stood next to their poster-board displays Thursday as the Nobel Committee made its way through a gymnasium, inspecting their projects. “I stayed up all night cutting out stenciled letters, mounting my results on construction paper, and using glue stick to get these cryo-electron microscope images onto my poster board,” said molecular biologist Richard Henderson, eyeing his competitors’ various displays of wind tunnels, volcanoes, and mathematical models illustrating the exponential expansion of space following the Big Bang. “The competition’s pretty serious this year. I saw one of the other scientists dropping Mentos into a two-liter bottle of Coke, and it looked pretty cool. Meanwhile, one of my graphs describing the three-dimensional structure of biomolecules fell off my poster right as the committee was walking by. 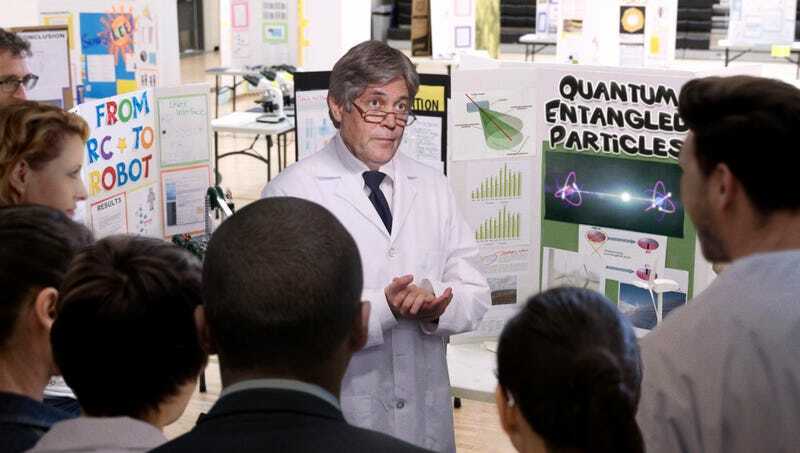 I really hope that’s not going to affect my chances of winning the Nobel Prize.” At press time, sources confirmed theoretical physicist and cosmologist Alan Guth had been disqualified after the committee concluded his parents had clearly done most of the work for him.